‘The Georgian House’ is a fairly recent name given to the house in Thornbury whose address is currently number 6 The Plain, but over the years the house has had several different addresses. This can be attributed to its position on the junction of three roads which are now known as The Plain, Gloucester Road and St John Street. We don’t know for sure when the original house was built. It was there in 1839 when we have a plan of the property being sold at that time, and this is also confirmed on the 1840 Tithe Map. We have several other documents relating to the property, the earliest dated 1767. We believe from the descriptions of the buildings in these documents that the main house was not built at that time. “that toft formerly in the tenure or occupation of William Barrows and of and in two other tofts near or adjoining to the same with the several garden plots or parcels of ground to the said several tofts belonging and also of and in all that outhouse or must mill near or adjoining to the said toft with the press mill and appurtenances to and in the same fixed used and belonging and also of and in the orchard adjoining to or near the said tofts and must mill containing by estimation one acre and a half (be it more or less) adjoining on the westward part thereof to a lane or highway called Collwell Street Lane and on the north unto the lands late of Richard Wilkins deceased and also of and in all that messuage or tenement wherein Joseph Williams wheelwright doth now inhabit with the work shops Backside Garden and orchard thereunto belonging situate and being in a street called St John Street all which said messuages or tenements tofts must mill gardens orchards premises above mentioned are situate lying and being in or near the borough of Thornbury aforesaid“. We believe that the toft and must mill referred to the buildings, immediately behind the Georgian House which are referred to now by the addresses 1A, 1 and 3 St John Street. These buildings were once part of the same plot of land as the Georgian House and became attached to it when it was built. This is confirmed by the plan included in the indenture dated 1837 which shows the must mill clearly to the right of the Georgian House. In the plan shown here, the black area is marked “must mill 1757”. The pink area is the property which later became known as The Georgian House. A “must mill” is for pressing fruit juice and in this case is presumably a cider mill and was part of the large orchard which used to be on land behind that site. A “toft” is a homestead, a piece of land or hillock and may be a reference to the fact that the area of ground at the top of Gloucester Road is at the top of a long incline. An entry in the Court Roll in January 1824 shows that the property was still ‘a ruinous toft’ when it was conveyed by George Rolph to James Ford. This transaction is listed in the schedule of deeds relating to the Georgian House. We assume therefore that the Georgian House was built after that time and built by James Ford. Thomas Clark. Our earliest source of information about owners is an Indenture dated 20th March 1767. This shows that the property had previously been part of the estate of Thomas Clark, a tallow chandler. Thomas’s wife, Sarah, had died aged 53 and was buried on 9th December 1749. The property then comprised of a large garden with several tofts, a must mill and a house used by blacksmith Joseph Williams (which we assume to be the property now known as 5 St John Street). In his will dated 16th June 1750 Thomas left all his property to his children, Thomas and Sarah. He died and was buried on 10th May 1761. George Rolph. On March 20th 1767, Thomas Clark junior, a tallow chandler conveyed his half part of the property to George Rolph, an Attorney at Law. George was to marry Thomas Clark’s sister, Sarah, within a couple of months of the sale. Sarah was the owner of the other half share so the whole property became owned by George Rolph. George Rolph was born in 1727, the son of John Rolph of Almondsbury. His first wife was Susannah Cox and they had seven children. She died 25th September 1765 aged only 41, soon after their seventh child was born. On 20th March 1767, shortly before he married Thomas Clark’s, sister, Sarah, George bought the property from him, including the must mill. James Ford. In January 1824 a “ruinous toft and garden” were sold by George Rolph, the son of Thomas and Francis Rolph who was living in Canada, to James Ford, an inn holder. James Ford owned a large parcel of land which included all of Laburnum Terrace (the terrace of houses at the top of the Gloucester Road) and the surrounding property. The agreement of February 12th 1839, makes it plain that there was a house on the property when James Ford owned it and that James Ford let the house to a Mrs Cooke. This ties in with the information we have been given about a plaque on the wall (probably in the garden) which bore the date of 1835. By 1841 James and his wife, Lydia had moved to Bredon in Worcestershire and then the census of 1851 shows they had moved to Castlemorton in the same area. James was aged 67 by this time and described as a farmer of 32 acres. Mark Meredith died in 1894 aged 77 years. In 1898 Mark’s daughter, Hannah Hardy Crossman Meredith relinquished her interest in the property to her brother, Thomas, another farmer, for £700. 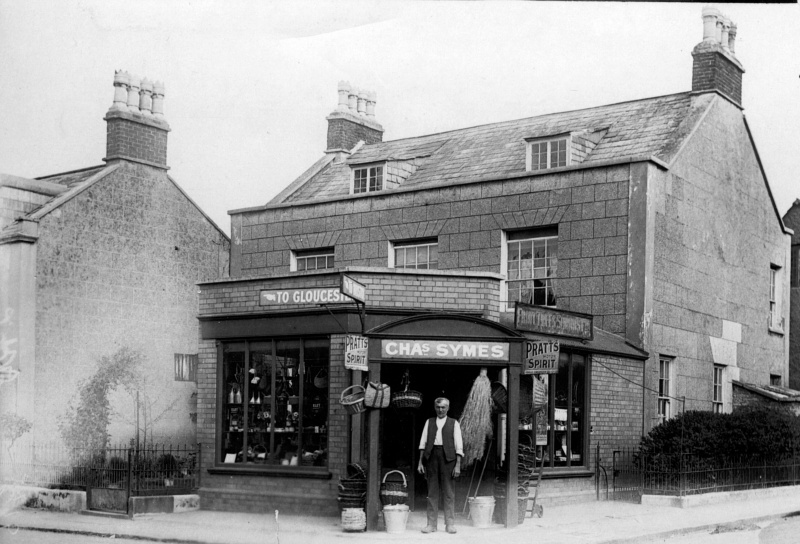 In 1898, Thomas sold the property to Charles Symes. In accordance with Rose’s will dated 6th February 1970 the property was left in trust to her brother in law Albert Pridham and his wife Bertha Pridham and in the event of both of them pre-deceasing her then it was left to Albert’s son, John. We are grateful to John Pridham (known as Jack) for leaving a wonderful description of the house and shop based on his childhood memories. Following the death of Rose Symes in 1970, the shop (and the room behind it) were let out to tenants. Albert Pridham and his new wife, Bertha, continued to live in the rest of the house. For a time the shop became Fairfield Gardens Shop. It is listed as located there in the 1967 programme for the Thornbury Flower Show. We have been told that this was run by Warren Fowler family who sold fruit and vegetables and they were noted as being the tenants in 1970 when Rose Symes died. However we have also been told that the garden shop was run by John Fane de Salis and the name of the shop shown in the advert on the left suggests that it was set up as an outlet for the produce grown by John Fane de Salis at Fairfield House. 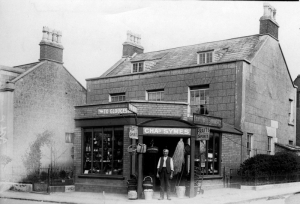 When the “new” shopping arcade appeared in Thornbury the Fowlers moved the shop to that site. For many years, as older Thornburians will remember, the shop traded as ‘Whites’ the electrical retailers where we ourselves bought fittings and fuses etc in the 1970s. For a shorter period in the early 80s it became a shop where people could rent or buy videos. On 20th November 1987 the house was sold by the Pridhams for £95,000. It was bought be Brian and Janette Elizabeth Simpson who lived at Charfield. We have been told by Ken Wilkins, who was a neighbour at that time, that Brian Simpson, the owner of the fish and chip shop in the High Street. It was subsequently acquired by the HSBC bank who left it empty for some time. It was occupied by squatters during this time and the house fell into disrepair. The house was eventually acquired by a local entrepreneur, Tony Johnson. Tony had given up a career as a teacher and had various businesses in Thornbury including an agency for renting villas in Spain, which he ran from an office in Castle Street. He saw the potential of the large house as a nursing home for the elderly. He pulled down the old shop, and restored the front garden. Tony opened the nursing home in 1994 in partnership with Bev Kelly. Tony gave the house the name of ‘The Georgian House’, a very fitting title and that ended the long standing confusion over its address. It was also pleasing to see such a sensitive restoration of the house, although the work was financed by the sale of a large part of the huge rear garden to Crest Homes for the building of the houses in Sawmill Lane. The nursing home business, however, failed to live up to expectations and closed after two or three years. The next business to occupy the house was the Thornbury Chiropractic Clinic. This was owned initially by Pam Cronin, but she left the business in 2005/6 and it has continued under new ownership.